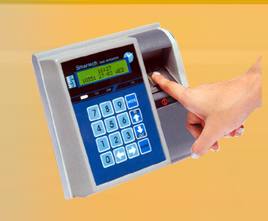 Computersied Time Reporter is a state-of-the-art swipe card or RFID card based time recording system. In this system each employee is provided with an ID card which he/she has to swipe or show to record his/her in and out timing. It links to a computer where the recorded data is processed to generate reports. • Accurate & faster recording of in & out timings. • No more manipulation of timings. • Instant access to information on absentees, late comers, etc. • Perfect calculation of work-hours, overtime, etc. • Quick generation of reports and pay slips. • Significant saving of man-hours in generation of reports and pay slips. Depending on the cost, no of employees, employee ID (numeric/alphanumeric) and the work environment one of the following card technology can be selected. Employee ID is printed as bar code on the card. Employee ID is encoded on a magnetic track on the back side of the card. Employee ID is encoded as two rows of holes on the card. Employee ID is encoded on a chip on the card which is read by card reader using radio frequency field. Employee number when the card is swiped .Messages/Greetings for all the employees. Message/Greeting for a single employee exclusively. Time Reporter’s Non- volatile memory retains recorded data for over ten years. The Inbuilt smart UPS works in spite of power failure and switches off automatically in two minutes after the last card has been swiped to preserve battery life. • OK/ ERROR audio signal. Master card to set time/date and to enable/disable certain Time Reporter features. • Time Reporter can also be programmed to operate siren at different times in day. Even though the Time Reporter CTR-32 is primarily designed for time recording applications, it can serve additionally as a single door access controller. This feature allows a convenient combination of time recording with access control. The terminal can also handle a door sensor and an emergency exit switch. • 3000 records storage capacity (expandable to 12000 records). • Links to a computer serial port (RS-232/RS-485/Modem/Ethernet) for transfer of recorded data. • Up to 32 units of CTR -32 can be connected to a single computer. • Dimensions: 6.4" H X 6.8'W X 4"D.
• Power Requirement: 230 V AC+ /-15%, 5 watts. • In-built battery backup for operation in case of power failure. • Set its time & date. • Collect recorded punch/timing data from the Time Reporter. • This MIS software allows you to process the data received from the Time Reporter & generate the following reports. Presentees, Absentees, Arrival, Early Arrival, Late Arrival, Departure, Early Departure, Overtime, Irregularities, Punch, Missing Punch, Performance, On Leave, Summary. Performance, Presentism with Overtime, Presents with work Hours, Present with Late Arrival, On Leave Summary. Muster, Performance, Presents with Overtime, Presents with Work Hours, Presents with Late Arrival, Shift Schedule, Summary, Leave Consumption.